Chess is one of the oldest games still in popularity today. Like anything that old, it has changed throughout history to eventually become the game we love today. Let’s take a little look back through time. The origins of chess goes back some 1500 years to around 600ad in northern India and was called Chaturanga. While the board and pieces were similar there were some striking differences from modern chess. In Chaturanga (which means the four divisions) there were four players on the board instead of two, there were only four different pieces and pieces were moved according to the roll of the dice. The pieces were also a little different and were the infantry, cavalry, elephantry and chariotry. These pieces eventually evolved into the pawn, knight, bishop and rook respectively. From India it was taken and played by the Persians. Around the mid 600s when the Muslims conquered Persia this spread the game into most of the Muslim world. The Moors took it with them in their conquest of Spain which introduced the game into southern Europe around 800ad. It was not only invasions and conquests that spread the game, but also traders and pilgrims who took it into Russia and China where it was adapted into other variants of the game such as Chinese Chess or Xiangqi. By 1000ad the game was well known throughout most of the world including Asia, Russia, and Europe. The idea of check and checkmate were introduced very early in the game around 600ad and were Shah and Shah mat respectively. By 850ad the dice were no longer used due to restrictions on gambling the the Muslim communities. It was also around this time that the pieces went from actually representing soldiers and other people, to being more abstract, supposedly due to the Muslim misgivings about representing humans. 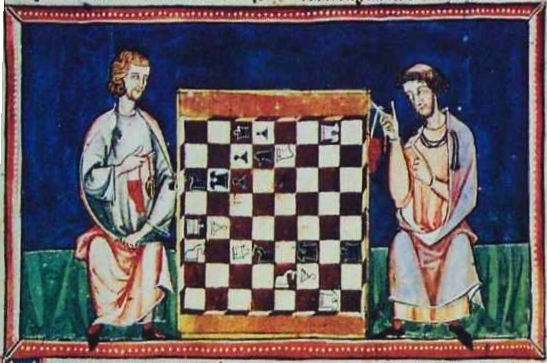 The biggest changes came in Europe around 1500ad with rule changes such as allowing a pawn to move two squares on its first move, allowing the king one jump (leading to castling), and the movement changes to the Queen from only being able to move one square and only diagonally to being able to move in all directions unlimited squares. These changes were easier to implement at this time because of the introduction of the printing press. 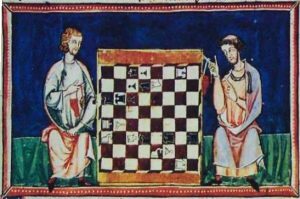 Early chess books were printed starting in 1495 and these could be printed and distributed all across the chess playing world. This made for fast rule adoption and easier standardization, at least withing the confines of areas that read the same language. The game we play today started to be solidified with the need for standardization created with the first World Chess Championship in 1886. Until that point, there was really no need for a single set of rules for everyone in the world to follow. This was followed by the creation of the FIDE (Federation Internationale des Echecs) or World Chess Federation on July 20, 1924 in Paris. The FIDE is responsible for organizing and facilitating all the World Championships and for defining the rules of chess. With all the regulation and organization we have today, you can play people from all walks of life, and from all over the world, you do not even have to speak the same language because you both speak the language of chess!